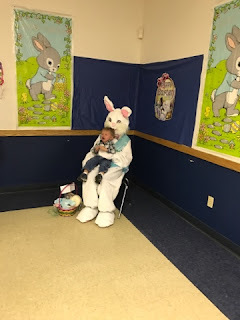 This past Saturday was breakfast with the Easter bunny at one of the local AmVets that my father belongs to. This year it feel on a weekend I didn't have Ella, so Brian just took Austin. Last year Austin loved the Easter bunny. This year was the complete opposite. As soon as they walked up there and put him on the bunny's lap he screamed. 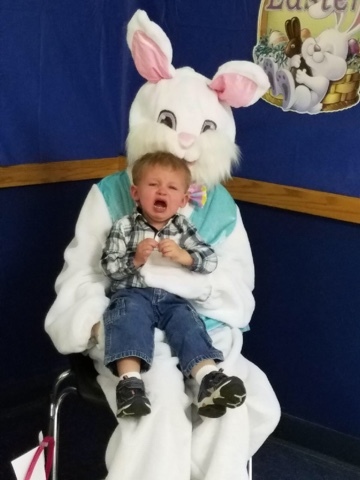 He wanted nothing to do with the bunny. I love his dramatic face. I wish I was there to see it. When my niece Claudia got called up there, my father decided to give it a try again. Still no such luck. He wouldn't even let go of his coat. He was as happy as can be as soon as he got back in his fathers arms. 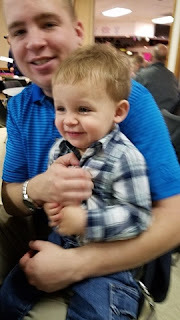 You can see he was even crying real tears. 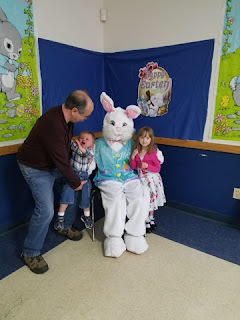 Why do we make our kids go through this just to get a picture with a big scary looking bunny? Who knows but it will happen again next year.